During the holiday season, every team at UncommonGoods is very important – from the Outbound warehouse staff packaging up your orders, to the Tech Team making sure our website is in ship shape, to our Purchasing Team who makes sure all of our best sellers are in stock – but one team stands out in my mind as being integral in making the most special holiday gifts happen. 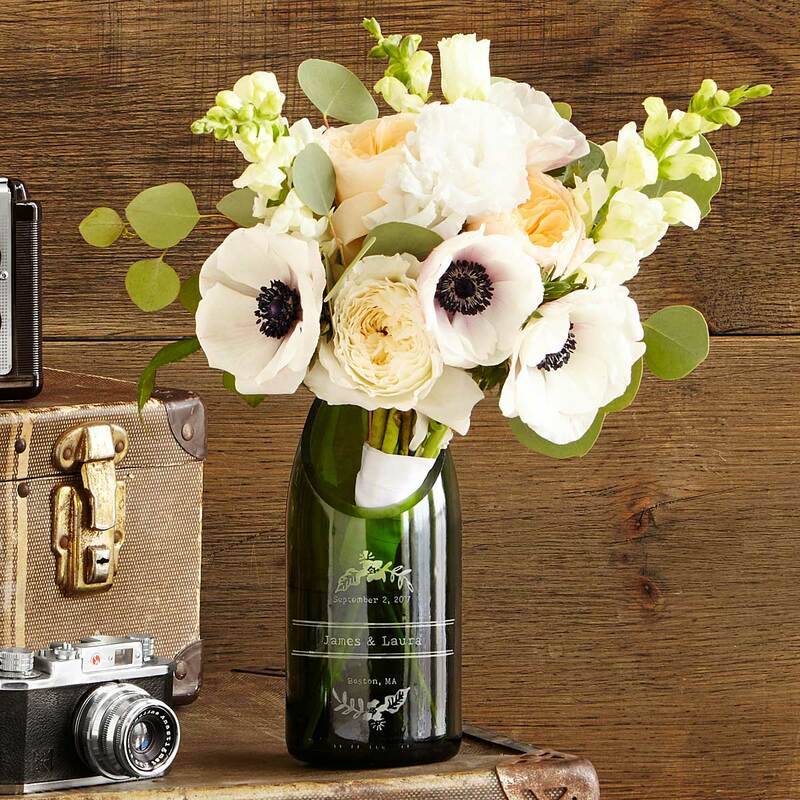 Our Drop Ship team is the liaison between our customers and artists to make custom gifts like the Anniversary Wine Box and the Personalized Family Print happen. What does “drop ship” mean anyway? It’s the term used when an item is shipped straight from the designer to the customer. To ensure the product is perfect before heading to our customer, the Drop Ship team collects the information so the artist can customize the product. In many cases, the Drop Ship team checks back with the customer with a proof of the product to confirm everything looks good. A custom gift is certainly very special so our Drop Ship team keeps busy during the holiday season, but not without deadlines. The last day to order most custom or personalized gifts is December 4, with an approved proof by December 9, so don’t hesitate. Time is running out! Each and every design challenge gives us the exciting opportunity to meet up-and-coming artists, reconnect with our favorite designers, and open our eyes to new and unique works of art. Coming off the success of the 2011 Jewelry Design Challenge, we simply could not wait to hold another call for jewelry entries. This year’s Jewelry Design Challenge brought in over 100 entries and showcased the unique designs of artists, jewelry designers, and metalworkers. Our judges worked through designs with bold patterns, fascinating stories, and unique mediums. They decided on pieces they thought would capture America’s eye with their delicate beauty and others with their intricate detail. But there was one piece that the judges couldn’t take their eyes off of; they loved its concept as a keepsake to keep those you treasure close. 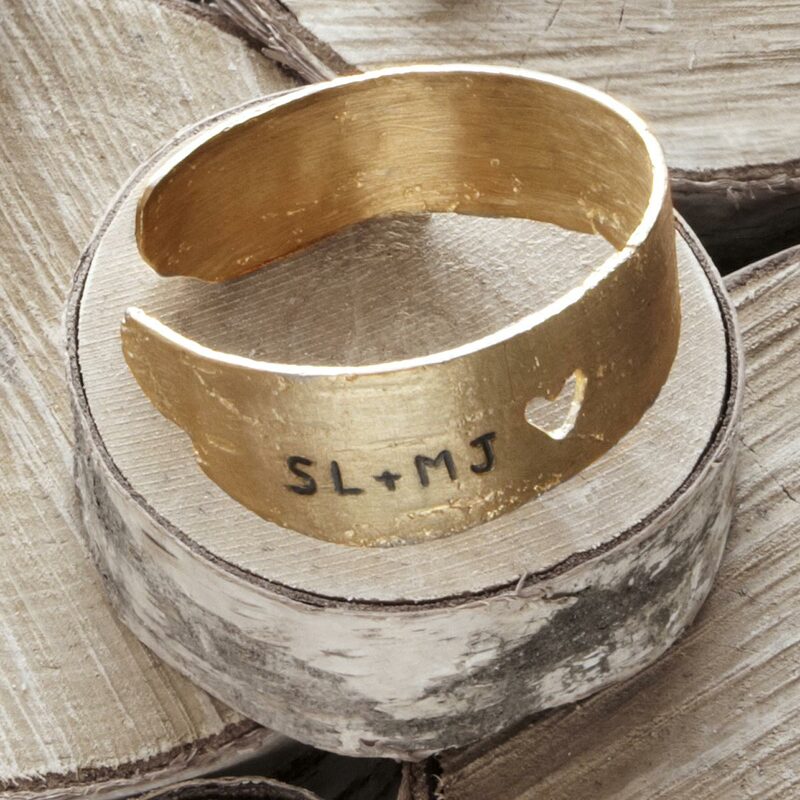 We simply can’t stop talking about the craftsmanship and attention to detail of Personalized Child Signature Necklace and are excited to introduce you to the designer, our Jewelry Design Challenge winner, Kim Jakum of Wisconsin. Kim thrives on designing one-of-a-kind pieces with her recently found love of PMC (precious metal clay) and she will soon be able to see those one-of-a-kind pieces being cherished by people all across the country. 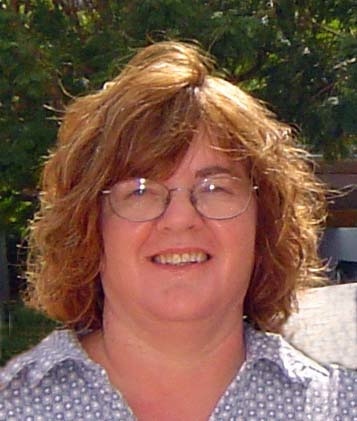 Here she is, Kim, the newest member to our Uncommon Artists family. 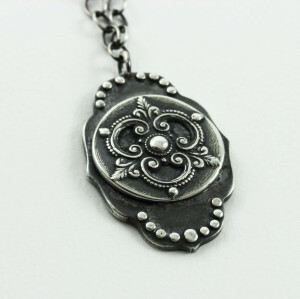 When and how did you discover jewelry design? I’ve been making jewelry for over 20 years. I first started making jewelry by just stringing beads. I was drawn to all the different shapes and colors. 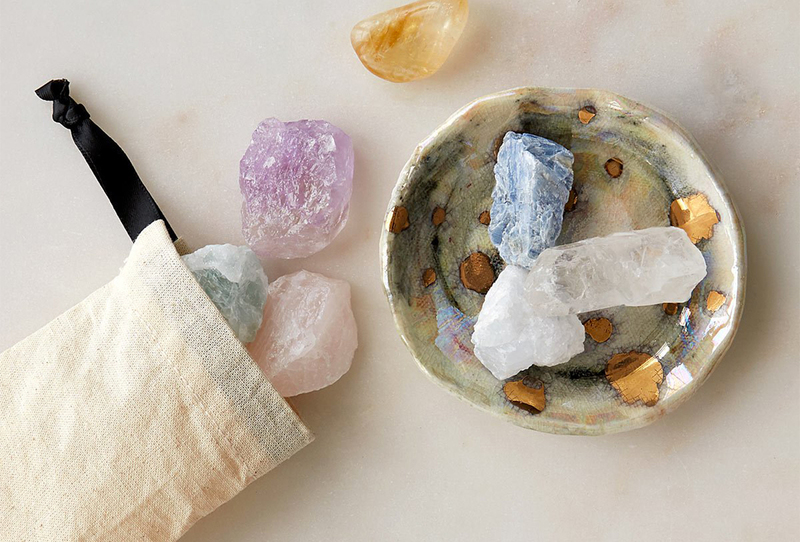 To this day, I’m still drawn to beautiful stones and the sparkle of crystal. 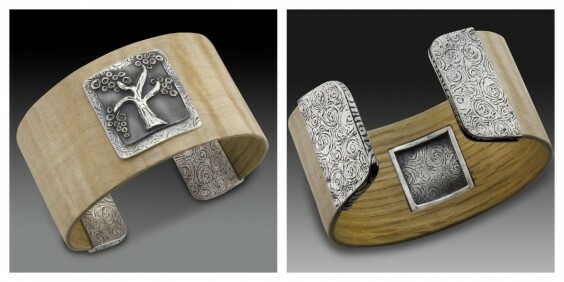 My favorite piece of jewelry that I have made is my Tiger Maple and Fine Silver Cuff. How did you realize that metalworking was your passion? 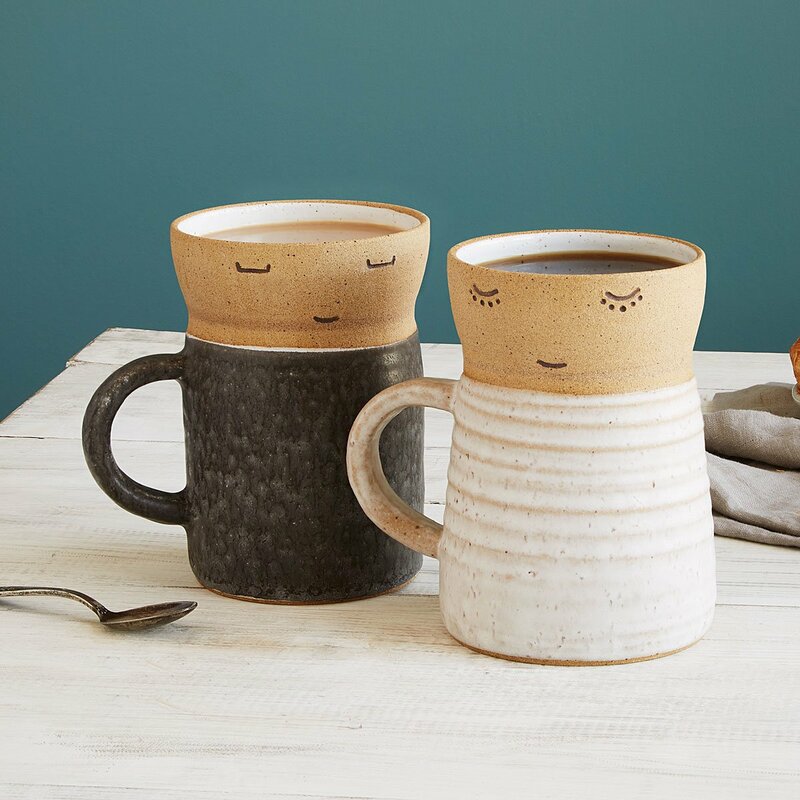 What are your favorite pieces to design? Besides the children’s signatures, I also take kids artwork, shrink it down and transfer it to fine silver pendants and key chains. I love that this makes an everlasting keepsake. I have also recently been accepted into The Artisan Group. 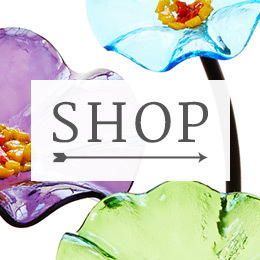 The Artisan Group is made up of small business artisans that gift celebrities with samples of their work. I’m having a great time designing jewelry for specific celebrities. All in all, you could say that a lot of my work is very personalized, made specifically for the person receiving it. I have been fortunate to take workshops from fellow jewelry artists who’s work I really admire. 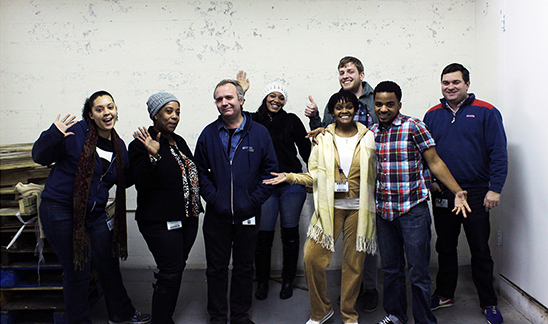 I find these workshops very inspiring, pushing me to continually learn a new skill and perfect what I already know. How else do you express your creativity? I like to pass what I know on, so I teach classes in jewelry making and PMC. 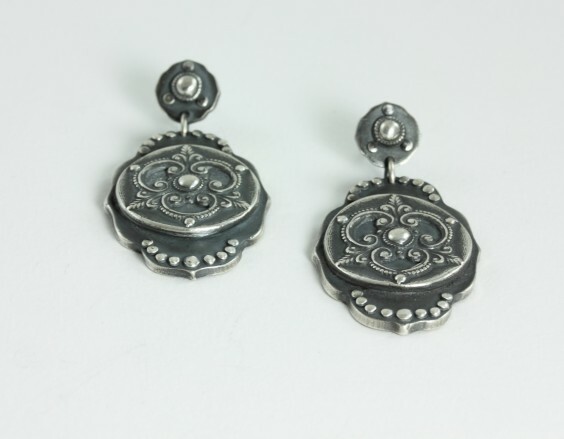 Also, if I see something I like in another medium, I usually think I can make something close to it myself, so there are a lot more projects other that jewelry making going on! What attracted you to the UncommonGoods Jewelry Design Challenge? I actually found out about this challenge from a fellow Artisan Group member and entered it on a whim. 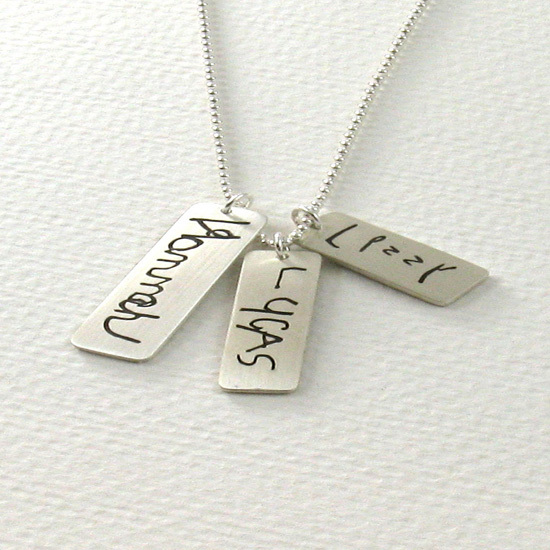 What was the inspiration behind Personalized Child Signature Necklace? The signatures on my Personalized Child Signature Necklace sample are actually my grand children’s. I have seen a lot of stamped name pendants and thought I could take that idea to a whole new level by using actual signatures! I also added a twist by texturing the back, so the necklace is reversible. Do you have any advice for someone interested in taking part in a future challenge? Just enter! Until this year I have NEVER entered a challenge or competition. I have entered four different challenges this year and have placed first, second or third in three of them! Picking a personal wedding gift is tricky. It has to be sentimental, but not too cheesy. Functional, but with more appeal than the stereotypical kitchen appliance. And, of course, it should be something the couple will cherish for years to come. Our community agrees, David Voorhees’ Personalized Wedding Wishes Vase has it all. Time and skill go into creating each of these wheel-formed, hand-decorated pieces, but using the finished product is actually quite simple. 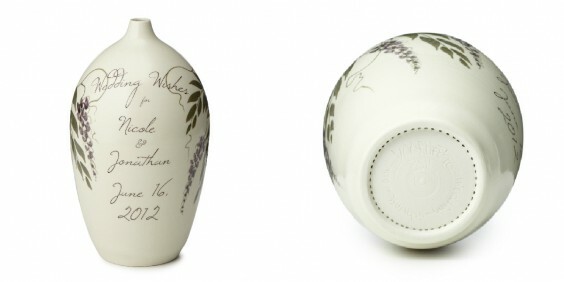 Each vase comes with a wedding poem (written by Voorhees) and blank sheets for writing your own wedding wishes. 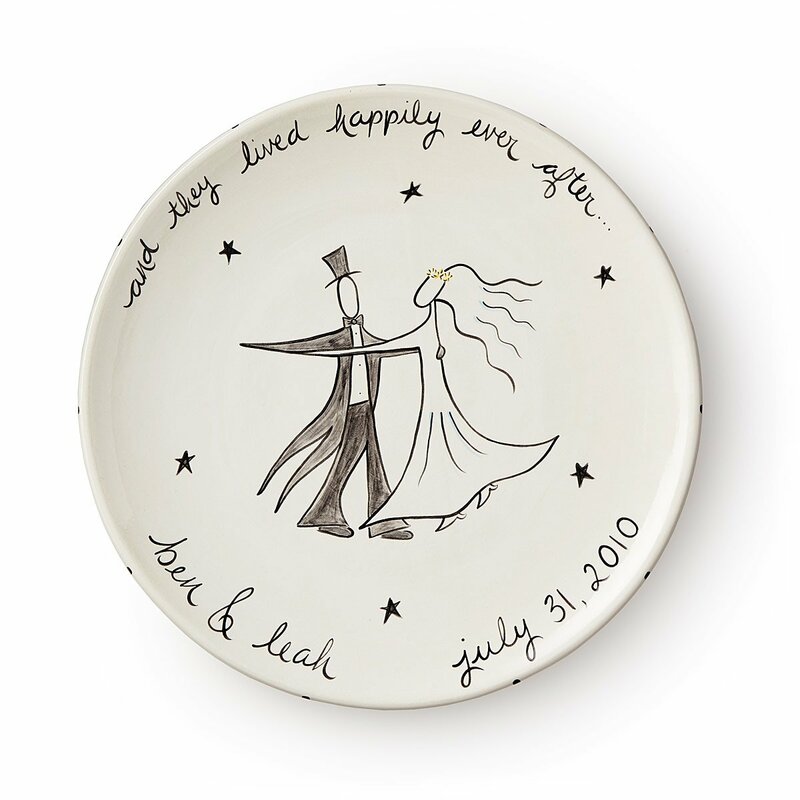 The couple can use the vase instead of a traditional guest book, or place it near the guest book table. As guests enter the reception, they are asked to write their very own special messages to the couple and drop them into the vase for the newlyweds to read on their first anniversary. Since the bottom of the vase is perforated, the artwork doesn’t have to be destroyed for the messages to be enjoyed a year later. Our buyers loved the handmade vase the moment they laid eyes on it, but wanted a little “relationship advice” before making the commitment to carrying this uncommon good. Our voters agreed that the custom creation is certainly something special. “This is a really great idea, beautiful and made in the USA,” Christie told us. “I love the idea of opening this on the couple’s first anniversary! 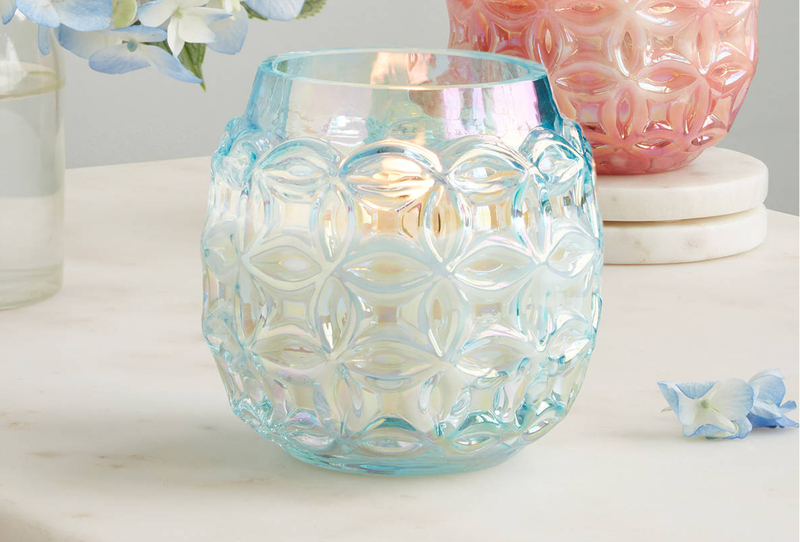 The perforated bottom is fabulous, since I would hate to wreck the vessel otherwise,” said Alli. Now Voorhee’s design is an UncommonGood, and it’s receiving fantastic reviews from those celebrating the marriages of loved ones in their lives. We’re proud to see such wonderful feedback coming in for such a clever and beautiful handmade piece. 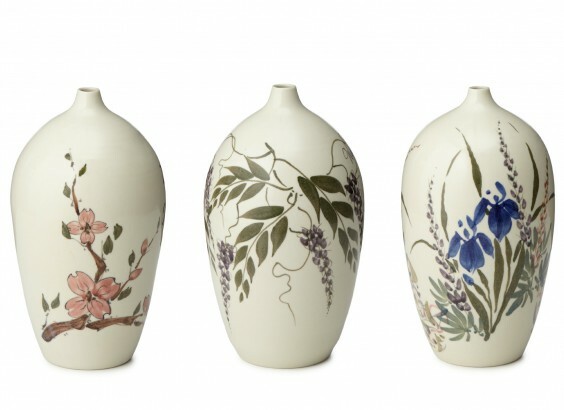 We’re looking forward to feedback from happy couples as they open their Wedding Wishes Vases to read warm messages and words of wisdom in years to come! Get Your Vote on the Board! 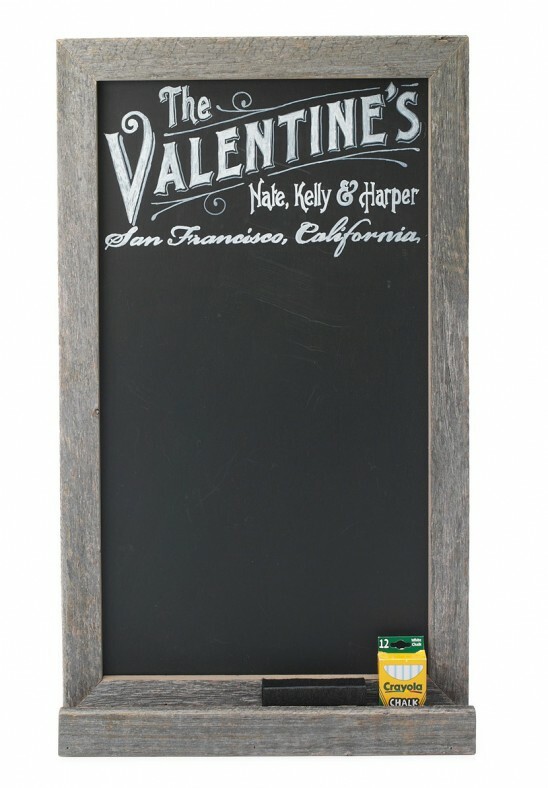 Handmade of reclaimed wood by artist James van Kriedt, this Personalized Chalk Board is hand-lettered with the family name scrolled across the top, first names below in bold, beautiful lettering and your hometown in script. 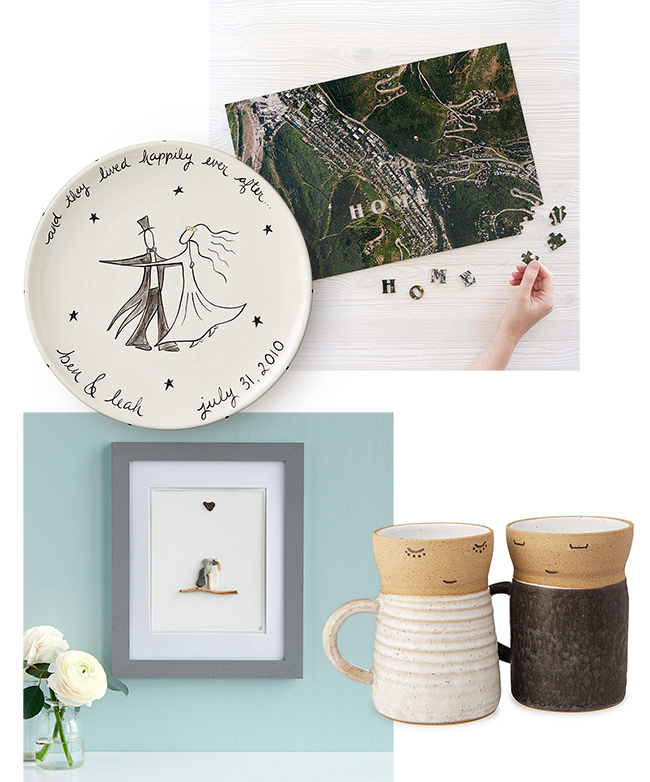 Would this board make a great wedding or housewarming gift for someone you know? Could you see this in your own home? We want to know what you think! Visit our Community Voting App to get your vote on the board, and feel free to leave a comment with your feedback, questions and suggestions. If you love the board like Becky, you can even sign-up to be notified if it’s added to our assortment!